The slump test is a very simple procedure for workability and because it only involves low-cost tools and can be quickly done on-site, it is used extensively on most construction sites. In most cases, the actual test is conducted according to the ASTM C143 specification. The test equipment required includes a standard slump cone, a slump base plate, a graduated tamping rod used to tamp the concrete mixture, as well as measure the amount of slump and other tools, including a material scoop, a funnel, a brush and a trowel. 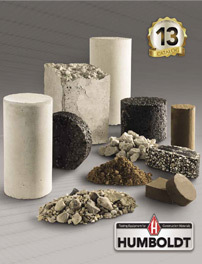 Humboldt provides complete test sets, individual components and the K Slump Tester to implement accurate and simple slump testing for the construction industry. If you have questions or need help selecting equipment, please call us at 1.800.544.7220 or use our Quick Response form.